The Birmingham pub bombings were not murder but "an IRA operation that went badly wrong", an inquest has heard. Former IRA intelligence chief Kieran Conway said the attacks were "not sanctioned" by the IRA and were "accidental deaths". Giving evidence at the inquest, Mr Conway described it as the "disaster in Birmingham". The blasts hit the Mulberry Bush in the base of the city's Rotunda and the Tavern in the Town in nearby New Street. Mr Conway was asked by barrister Kevin Morgan, on behalf of the relatives, if the pub bombings "constituted murder". Speaking via a video link from Dublin, Mr Conway, who was convicted of handling explosives in Northern Ireland in the 1970s, replied: "I believe it was an IRA operation that went wrong. "Had the IRA deliberately targeted that pub with the intention of killing civilians then that would have been murder, yes. "But in the circumstances, as I have been told, I don't accept that it was murder." He also described the deaths as "accidental". When asked who was responsible for the attacks, Mr Conway said "everybody collectively involved in the IRA at that time bears a full and awesome responsibility for what happened". But he said he only knew the identities of the bombers from newspapers and books in the public domain, and said he would not name "IRA men" still alive. Mr Conway said the group accepted the mistake was down to the phone box, selected to call in the advance coded warning, being out of order which delayed the call. Coroner Sir Peter Thornton QC asked Mr Conway if the the faulty phone box story could have been a "well-orchestrated and convenient lie" for the bomb team to tell their superiors and escape punishment. Mr Conway agreed it could have been but denied the leadership would have "looked for an excuse" as well. He said the policy of the IRA at the time was civilian targets were "strictly and loudly forbidden". 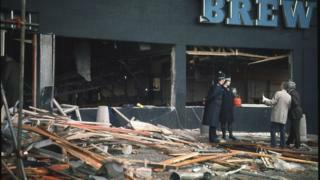 Birmingham pub bombings: Who were the victims?